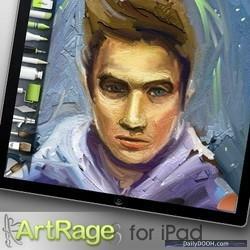 DailyDOOH » Blog Archive » #CES – ArtRage Lets Anyone Play Picasso! #CES – ArtRage Lets Anyone Play Picasso! Ambient Design, New Zealand-based award-winning creator of realistic art painting software for Mac & Windows, is offering ArtRage 3 Studio artist software for more computers, including the all-new MSI multi-touch Wind Top AE desktop series just announced, and is also offering the software at a discounted price for the iPad during the Consumer Electronics Show. ArtRage 3 Studio artist software is now available bundled with select touch-screen computers, including the Wind Top, allowing users to draw directly on the MSI touch screen to simulate watercolor or oil painting, with realistic paints that smear and blend just like in the real world. Other ArtRage art studio tools are so realistically simulated, that beginning and professional artists, hobbyist and students alike will feel comfortable using a computer to paint, draw and sketch. ArtRage 3 Studio is also being shown on the just announced ASUS EP121 Win7 tablet computer at the ASUS CES showroom at the Venetian Hotel Ballroom, Level 3, San Polo 3501A. And world-renowned artist David Kassan is demonstrating at the Showstoppers CES event, held at the Wynn Hotel Jan. 6. Kassan is displaying his artistic finger-painting technique using ArtRage on iPad and touchscreen computers painting on-the-spot with models. And to attract Apple’s iPad devotees, ArtRage for iPad is being discounted to $1.99 from Jan 6-9 (normally $6.99) at the Apple iTunes Store. ArtRage for iPad lets anyone become a mobile digital artist, providing the experience of actually ‘painting’ digitally on a computer canvas with oil painting effects that smear and blend and watercolor strokes that merge to create soft, wet gradations, just as they would in a traditional art studio. An ArtRage-enabled iPad, tablet, or touch-screen laptop allows artists of all levels to bring their computer everywhere they go to be ready to spontaneously unleash their creativity on the spot by drawing, sketching, and painting in a wide range of artistic styles with tools that interact on the screen just as they would with real paint, ink, chalk, pen, or pencil. The desktop versions of ArtRage for Mac & Windows offer more features, and are priced at $40 and $80 for ArtRage 3 Studio and ArtRage 3 Studio Pro respectively. available at www.artrage.com. This entry was posted on Thursday, January 6th, 2011 at 10:03 @460 and is filed under Scuttlebut. You can follow any responses to this entry through the RSS 2.0 feed. You can leave a response, or trackback from your own site. Why Use @BroadSign Serv Direct?